West Australian ensemble GreyWing present six works where the machine is front and centre. Ex Machina explores music made from, and inspired by, machines and the mechanical. Russolo’s The Art of Noises (1913) proclaimed “we get infinitely more pleasure imagining combinations of the sounds of trolleys, autos and other vehicles, and loud crowds, than listening once more, for instance, to the heroic or pastoral symphonies”. Ex Machina explores music made from, and inspired by, machines and the mechanical. Works include pioneer in the field Robert Erickson, contemporary Europeans, James Saunders, Peter Ablinger, Joanna Bailie and new works by Camilla Hannan, Lindsay Vickery and Dane Yates. Ex Machina deals with juxtapositions and parallels between the musically organic and assertive electronic gestures; creating something with an importance on focus dealing with ethereal yet organic sound. Robert Erickson’s ode to industrialization Nine and a Half for Henry (and Wilbur and Orville) recorded in refineries, on a freeway and up a carillon tower. Book of Returns by Peter Ablinger a modular work containing solo-pieces, solo-electronics, a cassette player, a single note or a scale, a performative situation, experiments with microphones, field recordings, picture projection, and occasionally, “ensemble situations”. Joanna Bailie’s Trains, in which the cellist moves between traditionally-notated melodies and material exploring locomotive sounds. James Saunders’ instruments with recordings, a subtle work, pairing acoustic instruments and electro-mechanical recordings. Vinosity, in which Dane Yate explores Australia’s reputation as a “drinking machine” via teenage drinking stats and sampled “Goon Bags” and Sound Artist Camilla Hannan and Lindsay Vickery collaborate on Telescope Turbine bridging Hannan’s field recording of the mechanics of astronomy with acoustic instruments. 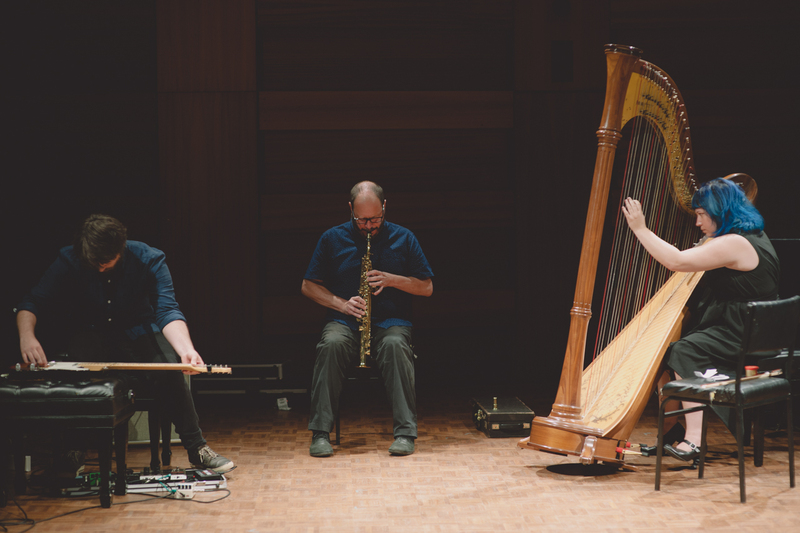 GreyWing focuses on new australian music and environmental music and has presented over 30 premieres since their debut performance in April 2016. An important thematic strand in the GreyWing concerts is music featuring field recordings, images and other data from nature and the environment. Earlier this year GreyWIng released two albums on the local label Tone List reflecting these two aspects of their work Lines of Flight and nature forms i. In July GreyWIng together with Breaking Waves and Gerygone launched a monthly site-specific project Limited Hangout: in the field featuring works by local composers responding to and performed in specific the sonic/physical environments.